When isolating exosomes from plasma, fibrinogen and fibrin can impede efficient recovery. By pre-treating plasma with thrombin, the fibrinogen can be converted to fibrin and easily pre-cleared by a simple centrifugation step. The resulting serum-like solution can now be treated with ExoQuick, original formulation, for quantitative exosome isolation that is compatible with high-throughput methods. The ExoQuick Plasma Prep with Thrombin Kit includes both ExoQuick and thrombin for efficient exosome isolation from plasma. ExoQuick is a proprietary polymer that gently precipitates exosomes. For exosome isolation from plasma you can first defibrinate your sample with thrombin, and then continue with the standard ExoQuick protocol of pre-clearing your sample of cells and cellular debris, adding the appropriate amount of ExoQuick, refrigerating, and then centrifuging (see the product manual for protocol details). Your exosomes will be in the pellet, ready for resuspension in an appropriate solution. In electron microscopy studies, exosomes isolated with ExoQuick appear similar to exosomes isolated using ultracentrifugation1-2, and these exosomes are also active in numerous functional assays1-3. Exosomes isolated with ExoQuick can be used for all types of protein profiling and protein characterization studies, such as mass spectrometry, Western blotting, ELISA, and more. Higher protein yields are achieved by ExoQuick purification than by chromatography, DynaBeads, or ultracentrifugation. Exosomes isolated with ExoQuick also provide excellent samples for studying exosome-associated nucleic acids such as microRNAs, siRNAs, and even mRNA. 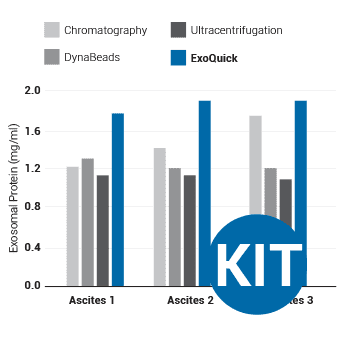 Quantitative analytical techniques such as qPCR, microarray studies, and next-generation sequencing are all compatible with nucleic acids isolated from ExoQuick-purified exosomes. Backed by a growing number of publications, ExoQuick is often the best option for researchers working with low sample volumes, such as clinical research samples or small animal models. ExoQuick exosome isolation methods are patented technologies4. Chugh PE, et al. Systemically Circulating Viral and Tumor-Derived MicroRNAs in KSHV-Associated Malignancies. PLoS Pathog. 2013. 9(7): e1003484. PMCID: PMC3715412. Umezu T, et al. Leukemia cell to endothelial cell communication via exosomal miRNAs. Oncogene. 2013 May 30. 32(22):2747-55. PMID: 22797057. Antes T, et al. Methods for Microvesicle Isolation and Selective Removal. Patent No. : US 9,005,888 B2. ExoQuick Plasma Prep with Thrombin can be used to purify exosomes from plasma1. With a simple workflow involving minimal hands-on time and low input sample volume requirements, ExoQuick is an excellent option for researchers who need to purify multiple exosome samples and/or samples from small animal models or clinical research samples. Isolate exosomes with a 30-minute low-speed spin (1500 g). Isolated exosomes can be found in the pellet and resuspended in an appropriate solution. You can verify the presence of exosomes with a number of different methods, including Western blotting for general exosome markers (CD63, CD9, CD81, and HSP70), NanoSight analysis, or EM (learn about different ways to detect exosomes and more in our Exosome Basics Guide). With ExoQuick, you can obtain high-quality exosomes from most biofluids using a protocol that can easily be performed on multiple samples and requires very low volumes of input sample. ExoQuick helps researchers discover protein and RNA biomarkers as well as study exosome biology by enabling fast and quantitative isolation of exosomes. Exosomes were isolated from ovarian tumor ascites fluid using ExoQuick, chromatography, DynaBeads, or ultracentrifugraion. The ExoQuick method consistently delivered higher concentrations of protein than the other three isolation methods used (Figure 1). Figure 1. (Top panel) Exosomal proteins were extracted from recovered exosomes, and the amount of protein determined by the Bradford microassay method (Bio-Rad Laboratories), using BSA as a standard. Proteins from each exosome isolate were standardized to the original sample volume and equal volumes were applied per lane of a 12.5% SDS-PAGE gel. (Bottom panel) Western Blotting was performed to analyze the presence of the specific marker protein, placental alkaline phosphatase (PLAP). The bound immune complexes were visualized by enhanced chemiluminescence (ECL, Amersham Life Sciences) and quantitated by densitometry (Un-Scan-it Software, Silk Scientific Corp.). With ExoQuick, you can quickly and easily isolate high quality exosomes for miRNA analysis (Figure 2). Exosomal microRNAs were recovered from ovarian tumor ascites fluid using either ExoQuick isolation of exosomes followed by Trizol extraction of RNA, Trizol extraction of ovarian tumor ascites fluid with no exosome isolation, or exosome purification using DynaBeads followed by Trizol extraction of RNA. The samples where exosomes were purified using ExoQuick showed the highest yields of microRNAs (Figure 2). Figure 2. Recovered RNA quality and yield was assessed using a GeneQuant II. Small RNAs were analyzed with the Agilent 2100 Bioanalyzer Lab-on-a-Chip instrument system (Agilent Technologies, Santa Clara, CA), using the Agilent Small RNA chip and reagent kit. Approximately 100 ng of isolated total RNA in 1 µl was applied to each run. The manufacturer’s recommended protocol was strictly followed to obtain Bioanalyzer profiles for the size range 6 to 150 nucleotides (nt). The profiles were calibrated for size (nt) using the small RNA ladder supplied with the kit, containing markers of 20, 40, 60, 80, and 150 nt in size, as reference. The instrument software quantitated the peak area between 0 and 150 nt as small RNA region, the area within 10 to 40 nt as miRNA region, and provides percentages of miRNA detected for each sample. Exosomes purified with ExoQuick from serum show the expected particle size distribution and high concentration yields when analyzed using NanoSight’s Nanoparticle Tracking Analysis (NTA, Figure 3). Figure 3.Exosome size distribution and yields from serum. Exosomes were purified from 50 pooled samples of normal human serum. 250 µl of serum was combined with 63 µl of ExoQuick, incubated at 4°C for thirty minutes, and pelleted by a 1500g spin for thirty minutes. The exosome pellet was resuspended in 100 µl of PBS, diluted 1:10,000, and visualized on the NanoSight LM10 instrument. The analysis shows that the ExoQuick isolation method recovered 90 nm exosomes at a concentration of of 2.74 x 1012 particles/ml.